Arden Grange Puppy/Junior Food (Rich in Chicken) is a nutritionally complete food for small and medium breed puppies from 2 months of age. Containing an optimum balance of vitamins and minerals to encourage steady growth and development, Arden Grange Puppy is a highly digestible recipe formulated to meet the demanding energy requirements your puppy will need in the early stages of their life. 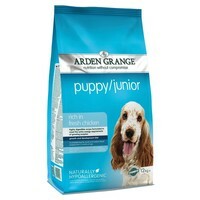 Arden Grange Puppy/Junior can be fed dry or moistened depending on preference.